was a standout in English club racing in the years following World War II. In the early 1950s he began competing on the European continent as well. In 1954-55 he joined Juan Manuel Fangio on the all-conquering Mercedes-Benz team. Moss backed up the Argentinian in his two championship years with Mercedes-Benz and won the 1955 Mille Miglia outright for the German team. He went on to an illustrious F1 career, well-covered on his Personal Site. Moss won both heats of the 2nd "Pacific Grand Prix" on October 22,1961. 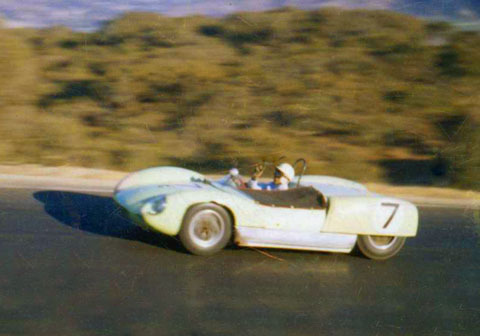 In this photo he climbs the hill in the 2.5 liter Climax-powered UDT-Laystall entered Lotus Mk.19. Moss also won the inaugural race on October 23, 1960, in the same car. 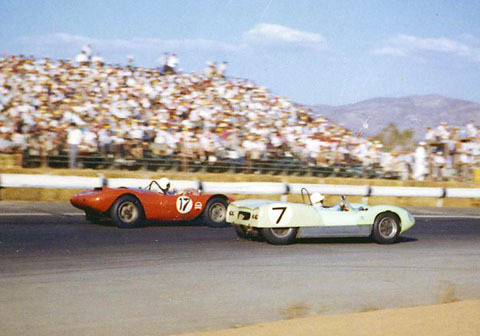 A week earlier, Moss led the early laps at the Riverside Grand Prix, only to fall back with mechanical problems. Here, he passes Bob Harris in the Campbell Special while rounding Turn 6. Moss recovered to finish 9th overall. Braking for Turn 7, he leads Ken Miles and Jack McAfee, driving Porsches RS61 and RSK respectively. New! More Sir Stirling Moss!